WASHINGTON — A military investigation into the Niger attack that killed four American service members concludes the team didn’t get required senior command approval for their risky mission to capture a high-level Islamic State militant, several U.S. officials familiar with the report said. It doesn’t point to that failure as a cause of the deadly ambush. Initial information suggested the Army Special Forces team set out on its October mission to meet local Nigerien leaders, only to be redirected to assist a second unit hunting for Doundou Chefou, a militant suspected of involvement in the kidnapping of an American aid worker. Officials say it now appears the team went after Chefou from the onset, without outlining that intent to higher-level commanders. As a result, commanders couldn’t accurately assess the mission’s risk, according to the officials, who spoke on condition of anonymity to discuss the results of the investigation before they’re publicly released. The finding will likely increase scrutiny on U.S. military activity in Africa, particularly the role of special operations forces who’ve been advising and working with local troops on the continent for years. The Marine general who heads combat operations in Africa faced questions from lawmakers about the investigation into the deaths of four soldiers in an October ambush in Niger. Four U.S. soldiers and four Nigerien troops were killed Oct. 4 about 120 miles (200 kilometers) north of Niamey, Niger’s capital, when they were attacked by as many as 100 Islamic State-linked militants traveling by vehicle and carrying small arms and rocket-propelled grenade launchers. Two other American soldiers and eight Nigerien forces were wounded. The investigation finds no single point of failure leading to the attack, which occurred after the soldiers learned Chefou had left the area, checked his last known location and started for home. It also draws no conclusion about whether villagers in Tongo Tongo, where the team stopped for water and supplies, alerted IS militants to American forces in the area. Still, questions remain about whether higher-level commanders — if given the chance — would have approved or adjusted the mission, or provided additional resources that could have helped repel the ambush. Army Col. Rob Manning, a Pentagon spokesman, wouldn’t comment on the investigation, beyond saying it’s now complete and being reviewed by Defense Secretary Jim Mattis and other senior leaders. The other U.S. officials said the final report could have consequences for U.S. military operations in Africa. Gen. Thomas Waldhauser, the Africa Command’s leader, is expected to recommend greater oversight to ensure proper mission approval and risk assessment, they said. Waldhauser isn’t expected to scale back missions in Africa or remove commanders’ authorities to make decisions. 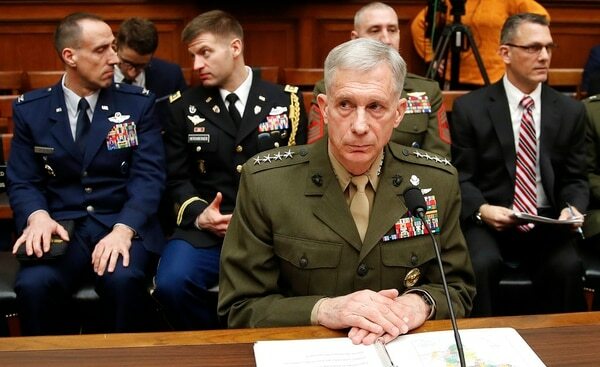 Testifying before the House Armed Services Committee on Tuesday, Waldhauser said that once Mattis signs off on the report, the families of the four fallen soldiers will be briefed on the results and then senior leaders will talk to Congress about it. He said he did not know when that would be, but suggested it could be several weeks away. He also said that troops serving in Niger do not currently get additional danger pay, as forces in other combat zones receive. He said he requested it “a while back” but is waiting for the Office of Management and Budget to finish reviewing it. The ambush incident is likely to trigger discussions about improved security measures, too, including heavier armored vehicles, better communications and improved individual trackers to make it easier to find missing troops. 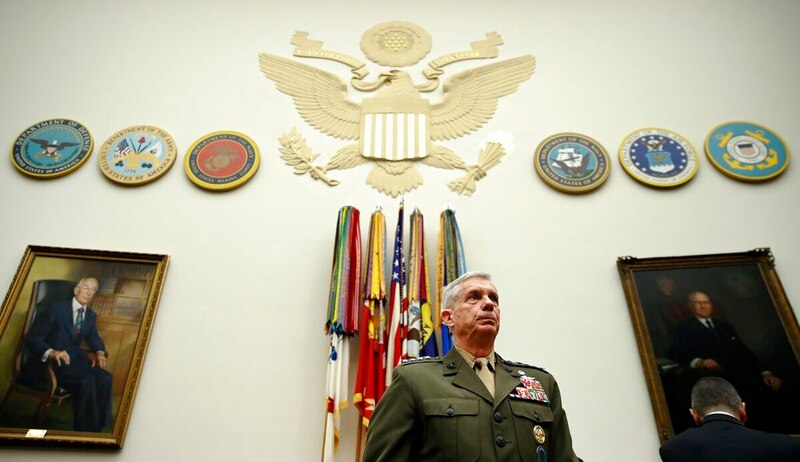 Top Africa Command officials, led by its chief of staff, Maj. Gen. Roger Cloutier Jr., have spent months trying to unravel the complex incident, conducting dozens of interviews across the U.S., Europe and Africa. U.S. and Nigerien officials say the troops received intelligence about Chefou’s location and acted on what was likely considered a fleeting chance to get him, or at least gather valuable intelligence on the American hostage. It’s unclear where Chefou was believed to be. But before arriving at that location, the U.S.-Nigerien team learned he had left. The troops traveled on to the site to collect any remaining information there. A second U.S. commando team assigned to the mission was unable to go because of weather problems. One Nigerien official said the troops that reached the destination found food and a motorcycle. They destroyed the motorcycle. The team then headed home, the official said, but stopped in Tongo Tongo to get supplies. The U.S. investigation notes the team stayed at Tongo Tongo longer than normal, but says there is no compelling evidence to conclude a villager or anyone else deliberately delayed their departure or betrayed them by alerting militants. The Nigerien official said Abou Walid Sahraoui, an IS leader in the region, heard the team had visited the site of Chefou’s last known location. He then dispatched about 20 fighters to pursue the U.S. and Nigerien troops. A larger group of militants followed later, said the official, who also would only discuss the matter on condition of anonymity. U.S. officials couldn’t corroborate that information. Shortly after leaving Tongo Tongo, U.S. and Nigerien forces were attacked and eventually overrun by the IS ambush. Army Sgt. La David T. Johnson, 25, of Miami Gardens, Florida, became separated from the others as he fought and ran for cover in the brush. He was gunned down, but his body wasn’t found until two days later. The other three Americans killed were Staff Sgt. Bryan C. Black, 35, of Puyallup, Washington; Staff Sgt. Jeremiah W. Johnson, 39, of Springboro, Ohio; and Staff Sgt. Dustin M. Wright, 29, of Lyons, Georgia. Black and Wright were Army Special Forces. Johnson and Johnson weren’t Green Berets; the others were. The U.S. troops called for help using the code “Broken Arrow,” which signals they were in imminent danger, officials said. They then followed procedures and shut down their radios to prevent the enemies from using them. As a result, they couldn’t communicate quickly with French aircraft sent in to rescue them. Some footage of the gruesome battle, taken off one of the U.S. soldier’s helmet cameras, surfaced in recent days in an IS propaganda video posted online. Officials said the procedural breakdown meant the overall mission lacked the higher-level command approval necessary to go after a senior militant. Such missions require approval by senior Special Operations Command officers who would’ve been in Chad or at Africa Command’s headquarters in Germany. The reporting failure meant those commanders lacked a complete picture of what the unit was doing, so concluded the mission was unlikely to encounter enemy forces. Had the unit gotten proper oversight and approvals, officials said, it might have been better equipped or included additional personnel more capable of sustaining a fight. Baba Ahmed in Bamako, Mali, contributed to this report.